While nearly every person walking the planet can now look at their wrist or in their pocket to discover the time, it was not always that way. In fact, there was a time not that long ago in the grand scheme of things that an entire city may not know what time it was, and it often fell to the church to tell them when it was time to come in from the fields or to leave work for the day. Here are some of the oldest clocks in the world that are still operational in some form or fashion. The Mechanical Clock at Salisbury Cathedral. The mechanical clock at Salisbury Cathedral is quite possibly the oldest operational mechanical clocks in the world. Built in 1386, the faceless clock was a deviation from the seasonal use of sundials for the residents of Salisbury. The clock chimed each hour and let all the people nearby know when it was time to attend church services. The mechanical clock was re-discovered in 1928 and a painstaking restoration was undertaken. Today the clock may be seen in the left naïve of the cathedral working away, without the hourly chimes, much as it did over 600 years ago. 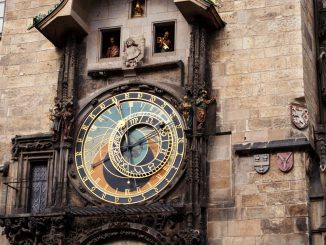 The Orloj is one of the most famous and most recognizable old clocks in the world, and is located in the old town square in Prague, Czech Republic. Built in 1410, the Orloj is one of the first mechanical clocks ever built (technically considered the third clock built) but is the oldest continually operating clock. Placed on the southern wall of the old town hall, the Orloj is an astronomical clock with a dial representing the movement of the sun and the moon as well as highlighting various astronomical details about the sky above. 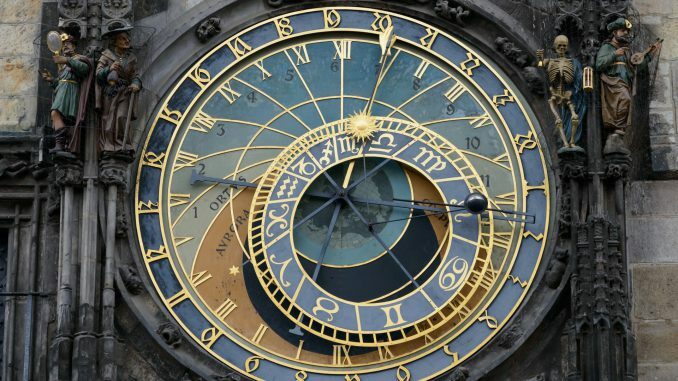 The oldest portion of the Orloj, the mechanical clock and astronomical dial, was made by clockmaker Mikulas of Kadan Mikuláš of Kadaň and mathematics and astronomy professor Jan Šindel. The Wells Cathedral Clock is an astronomical clock in the north transept of Wells Cathedral in England. The clock is one of the few built in the 14th century that survives to this day. Built between 1386 and 1392, the original mechanism resides in the Science Museum of London. The mechanism running the clock was replaced in the 19th century. The astronomical dials show a geocentric view of the universe with the sun, moon, and stars revolving around the Earth. The less ornate external dial displays the more common numerical face. The Gros-Horloge is a 14th century astronomical clock and is one of the most well-known clocks in the entirety of France. Installed in a Renaissance arch crossing the Rue du Gros-Horloge in Rouen, France, the 1389 mechanism is also one of the oldest in the country. Construction of Gros-Horloge was started by Jourdain del Leche and finished by the more expert Jean de Felain who would become the first person to hold the position of the governor of the clock. Originally constructed without a face, a single revolution represented twenty-four hours. The cast wrought iron movement is approximately twice the size of the Wells Cathedral clock and is perhaps the largest of this type of mechanism to still exist. The famous 2.5 meter diameter face of the clock was added in 1529 when the clock was moved to its current location.